Love this tune so decided to play along and recorded my attempt. Enjoy. This weekend I added functionality that will add new corridor when player activate the trigger and remove old corridor that is not in use anymore. In theory in game there will be only 2 corridors in one time. To illustrate it check this screenshot. Currently I build only 1 type of corridor but I am planning to create at least 10 different. They will be stored in array and randomly pulled and added to scene. Corridors will not have the same sizes so I will have to make sure that transition between them is very smooth. To main camera that is following character I added script (LevelCount) that will hold information how many levels are in the game. To my first corridor that is build in the game I added this script(LevelAppear). It works fine however I am not very happy with hard coded position when adding new level (1st line of AddLevel function). 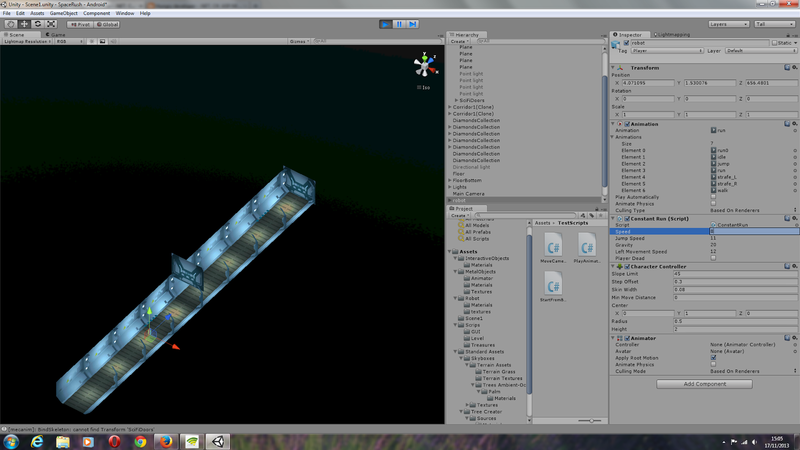 I must find a better way of finding a point where new corridor will be added without having to hard code position. If anyone have any ideas I will be grateful. This tutorial will be very easy for most of you intermediate developers, but I wanted to show bundle feature that is available in MVC 4 using date picker example. 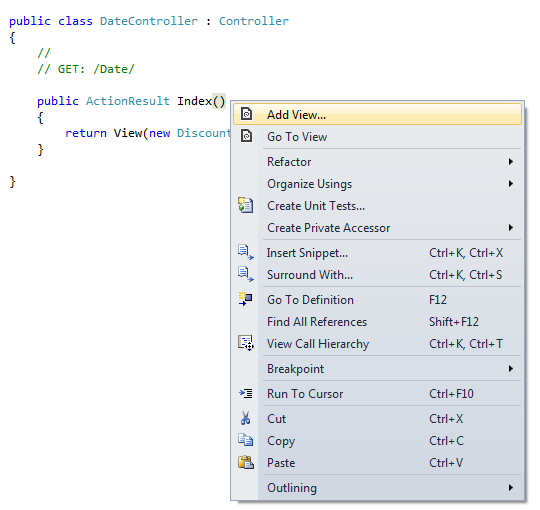 I will also show how we can add datepicker in previous versions of MVC. There are few methods we can do it however I will show you only 2. First we have to add some references to jquery, jquery-ui and styles. As I mention in mvc 4 we can use bundles which improve performance and give us less headache in the future. To access bundle configuration go to App_Start and open BundleConfig.cs. Open _Layout page and find at the bottom @Scripts.Render("~/bundles/jquery"). Cut it and paste inside head – sounds creepy. Also add @Styles.Render("~/Content/themes/base/css") and @Scripts.Render("~/bundles/jqueryui"). This way we included files we need to use datepicker. Using model for datepicker (preferred method). To use this method we are going to create Discount model. Create a new class and call it Discount. We are using simple constructor to define default date. Date are also formatted to show only date. Add new controller and call it Date and add new View from the controller(you can right click on the Action name and choose add View. Open Index view from Date controller. In view we added class for model (Components is the name of the project, Models is the folder where we created Discount class). As you can see we do not have to reference jquery here, as it was already referenced in Layout. In previous MVC you would have to include 3 separate files inside layout, or on the individual page (not recommended). In the old MVC version if you wanted to update jquery you would have to manually change the version name to match your newest jquery, where in MVC 4 system will automatically figure it out. Adding date picker without model. Main advantage using the model for datepicker is that you can very easily pass data from view to controller, where in other case you would have to formcollection. We have modified View a bit and added new controller SubmitDiscount. Run the application and go to date controller so your path should something like that localhost:9930//Date, put a break point for debugger on SubmitDiscount method. You will see that the fields we have submitted have been passed to controller via model. Now let’s use form collection now to pass date without using the model. And view by replacing dateTo model with input. Run the application and debug the method again. Choose dateTo and check your model and form. As you can see it is faster and more reliable to use model with date picker. All elements within the form are type of string so you will have to convert them if necessary which is time consuming and can be avoided.